Little Nemo in Slumberland comics. Everything from the color palette, paneling, and pacing to the background characters, font, placement of speech bubbles, and the ending are all indicative of Sendak and McCay. This is something that the Caldecott committee will definitely see, but will not be able to discuss. By utilizing these influential fantasy adventures about and by white males as visual touchpoints for “Stop that Yawn”, Pham and Levin have successfully carved out a space for the feminine. In having Gabby and Granny present as people of color, Pham and Levin have successfully turned these original stories on their heads. And have capably placed Gabby and Granny within the cultural cannon of bedtime fantasy adventures alongside Nemo and Mickey. There is, however, an illustration that is problematic. Shortly after entering Never Sleeping City, we see Gabby in a tower overlooking the crowded streets. In this crowd there is an anthropomorphized Gorilla walking next to black person, and they look strikingly similar. I can safely say that no book exists within a cultural vacuum, the likening of black people to apes has been prolific throughout history and pervades our culture still. I will also say, that no book exists without its own internal world view either. I firmly believe that as readers we bring all of our lived and perceived experiences to a text, every individual will inherently have a different response to this image and take something different away from this text. As critical readers it is our job to look at books and decide what that meaning is for us. Does this image detract from the overall value of this title? That is a decision I will leave up to you. 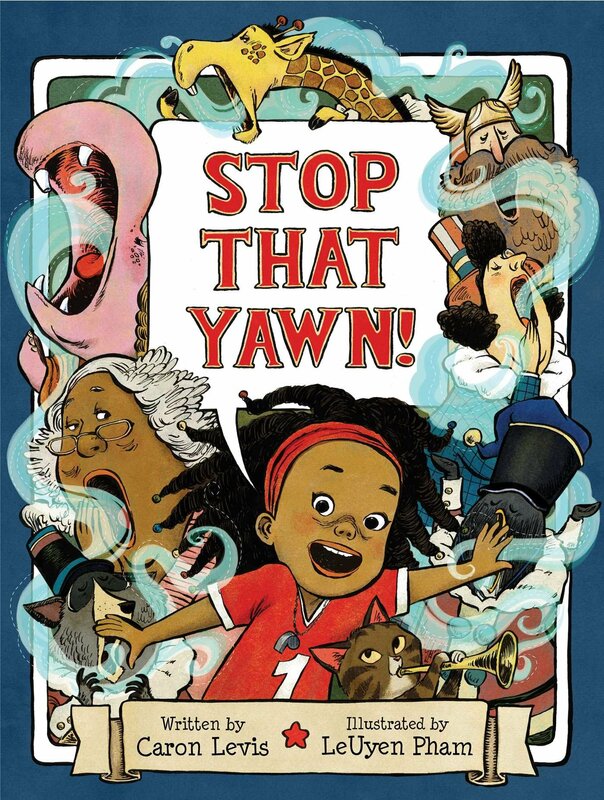 What do you think, is “Stop that Yawn” the most distinguished picture book of 2018? Be sure to cast your vote for ICPL’s 2019 Mock Caldecott on or before January 21st. For more reading on anthropomorphized apes in children’s literature I highly recommend reading Edith Campbell’s blog.